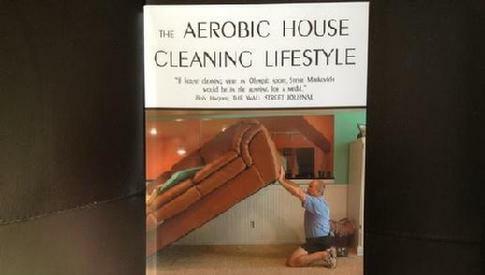 UPDATED APRIL 2019 -- Aerobic House Cleaning SINCE 1995 "The Most Unusual Fitness Book In The World"
THIS BOOK IS "NOT NOT NOT" ABOUT WORKOUT ROUTINES! IT'S ABOUT CHANGING THE HEARTS OF PEOPLE WHO HAVE TRIED TO STAY FIT BUT ULTIMATELY QUIT. AND HUMOR TO STAY MOTIVATED! AND NOT GYM EQUIPMENT, GYM MEMBERSHIPS, OR WORKOUOT ROUTINES! THE SIMPLE PHYSICAL ACTIVITIES IN THEIR EVERYDAY LIVES. BUY IT FOR SOMEONE YOU LOVE AND WHO NEEDS TO GET IN BETTER SHAPE. Link to story about 86,000,000 million Americans getting Type 2 Diabetes. Its going to he a rough time and going to get real. England, Australia, Canada, South Africa, Vietnam, Japan, and on and on and on. I have been using The Aerobic House Cleaning Lifestyle since 1995 to stay in shape. Think about that…1995. If you have a loved one who needs to get healthier and in better shape, but has tried and tried with no success, and is near giving up hope, This Book is for them. But even more important, The Aerobic House Cleaning Lifestyle is about MOTIVATING people to get moving using some prayer and Personal conversations with Jesus Christ. Eating good food and shunning bad food is also a BIGGIE.